True longwire antennas for SOTA? I’m excited about the NA/EU S2S event coming up in November, and was hoping to get a bit of advantage by choosing an antenna with a bit more directionality and gain. I’ve built a Vee Beam, but there are few summits where I can easily erect the thing, and fewer still in late November. My next thought was a longwire antenna (say 5 wavelengths on 20 or 17m). I’ve read a few posts from others who have used longwire for SOTA, but am looking for any advice on setup I can get. The hope is to have a summit with a tower for the operating position, with the far end of the longwire in the top of a tree. Obviously, this will slope downward, yet still be 12+ meters above the ground all the way along. That should put one of the lobes at a nice low angle off the end of the wire, right? Does anybody have any tricks for getting the wire over multiple trees? Seems like that might be a real pain. Anyway, just thinking out loud here. Looking for anybody with experience or opinion on this approach. Interesting project, would be worth a try! I’m thinking that 15, 17, or 20 might be open, so I might need the unun at some point if the tuner gets mad at the mismatch. Looks like I should try without it first. If you feed the antenna a quarter wave in from the end you don’t need the ground or counterpoise and you avoid the high resistance feed at the end. For multiband use the feed point can be at the average of the longest and shortest quarter wave and a 4:1 balun via low loss coax to the KX2 should work out nicely. It’s likely to tune up on lots more bands too. Hi ratio transformers often disappoint when used on multiple bands. Get out and activate and let us know how you go. My rig is a KX1 that I built myself in 2008. Since about a year I use the W3EDP antenne. The long part is 84 ft most of the times thrown in a tree. The short part is 17 ft laid on the ground. With the 3 W from the KX1 I work stations within 1000 km. From EA8 I worked also US stations. A DX QSO was from DL with VE1WT with 1.5 W from the internal batteries only. No baluns used and the internal tuner from the KX1 tunes on 80 m, 40 m, 30 m and 20 m without a problem. If you feed the wire at the end it does indeed need a high impedance feed arrangement like the 9:1 UNUN. That is what Bruce had in mind. 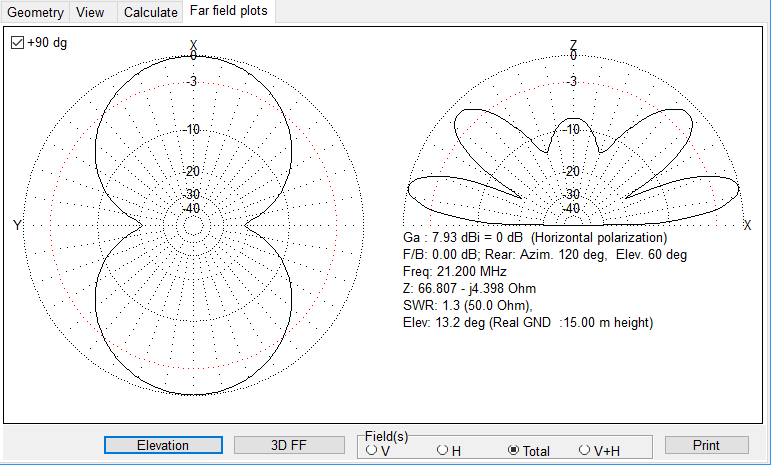 If fed in the centre then the feed impedance is going to be closer to the 140 ohms you mention. That’s a good result. Have you noticed that the wire length is almost exactly that of the G5RV? Sorry, that was a quick shot at the end of a long day. A “longwire antenna” cut to a length of multiple halfwaves and fed at one end is nothing but an EFHW antenna with an impedance value of 2200…4000 ohms (value differs depending on the various antenna experts, hi). Feeding the longwire at 1/4 wavelength from one end by means of coax may be indeed the most comfortable solution - and needs definitely no radials. We have just the summit to try a true long wire out on near here Bruce. DL/EW-002 Herzogstand used to have an enormous wire antenna on the side of the mountain for intercontiental communications and later ionespheric research. Unfortunately all that remains now are the concrete support blocks but even so running a few wavelengths out on 160m would be possible at this location - if you don’t mind a bit of climbing to install them HI! I use to work with a true EFLW. I just unroll the wire as much as it’s possible and connect it to a 1:9 unun (homemade). Then a 4 to 8 m of RG-174 to the radio and that’s it. No counterpoise. I work usualy with annyone of the KX’s (3, 2 or 1). Good results were achieved with no more than 10 W, normally below 5W. Alternativly I use a trapped dipole or a trapped EFHW (trap by SOTABeams). Success! I got a chance to try out the new longwire in the field under actual conditions, and it behaved very well indeed. This should be just the ticket for the S2S NA/EU event coming up. This was just an equipment test, not a SOTA activation. Setup went very smoothly, and the tuner handled the matching without incident. Initial listening on 20m was so-so, and it was apparent the band wasn’t really cooperating, so went to 17m. Big change! 17 was alive and kicking, with a ton of DX booming in. I immediately worked a station in Belgium on SSB and got a 57 report. France, Germany, Ukraine, all worked on CW or SSB with good reports. Heard, but did not work, some UK stations as well as one from Mexico (they were rag chewing, so I didn’t try to break in). Tried out 15 meters for a while and had more luck there, too. The antenna loaded well on 30 and 40 meters, and I made one QSO with a National Park activator on 40 SSB. Declared success and made a short day of it due to other obligations. Overall, a very impressive showing for a piece of wire. Here’s some of the modeling, done over a normal ground on the level (15m in this picture). I suspect the actual performance would see the TO angle increase, based on the sensitivity to the modifications I tried while playing with it. The slope of the hill more than makes up for that, however, giving a very low TO combined with a clear view of the horizon at the site. Good stuff! Running the model gives you a good idea as to what to expect in the field, even if the geology and physical set up are a bit different from the model inputs. Looks like it had good gain on axis and equivale4nt to a dipole off the side. Very nice. I was curious about Ron’s comments about the longwire off the side being equivalent to a dipole so I modelled a dipole. It looks like the longwire off the side is actually -8dB to a dipole. I’m sure Bruce has no intention of using the longwire off the side in any event. Bruce’s plot shows the antenna has just over 10 dBi gain and the side lobes are about 10 dB down, so sidelobe signal is about 0 dBi or -2 dBd. Yes a dipole can have gain at various elevations but my point was the long wire has gain in the preferred direction and quite acceptable signal in other directions. I have activated twice with a 21m longwire antenna and it performed greatly allowing me not only to log a very good number of EU chasers but also DX from across the pond. I would like to participate in the NA/EU S2S event and I will surely use an EFHW. Good luck with your long wire and I hope to copy you that day from some summit.